eToro is based in Tel Aviv, Israel, and was founded way back in 2006 by two brothers, Ronen and Yoni Assia and a partner David Ring. The company was created with the idea of an open financial trading and investment platform which everyone will find suitable. eToro has developed rapidly since its establishment, and currently, it is ranked among the best social trading networks. Regarding regulation, eToro (Europe) Ltd. is Cyprus based, and it is a Cypriot Investment Firm, with the registration number HE200585. The company is CySEC (Cyprus Securities and Exchange Commission) regulated under license number 109/10. Presently, eToro has over 5 million users in more than 170 nations. 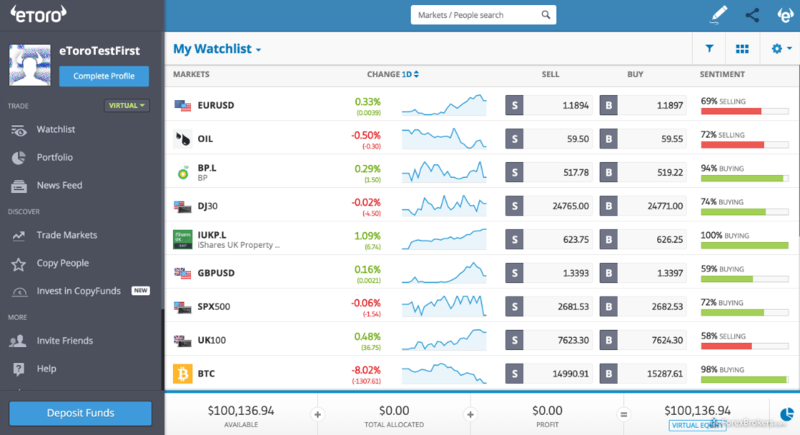 Traders on eToro can trade in currencies, CFDs, indices, and commodities. The brokerage’s online platform attracts thousands of new accounts daily as one of the world’s leading social investment networks. eToro started its social investment platform dubbed “OpenBook” in 2010, along with its popular “Copy People” feature, which provides new traders an invaluable guide on how to make successful trades without going through the trial and error stage. The “Copy People” page has everything that a new user needs to know about famous investors. Unlike new traders, experienced traders can also decide to share their trades to gain recognition and earn from sharing their successful trades. Traders that share their trades are classified into different tabs for easy collection of varying Risk levels, the number of followers, and Return percentage. eToro launched its first Android application in 2010, which enable traders to make trades using their smartphones. eToro’s innovative features allow investors to monitor, follow and automatically copy the top traders in the network, and they have now been substituted with an updated all-in-one eToro platform that is also available on the Android operating system. eToro is currently not allowed to operate in the United States, does not accept customers based in the United States. On eToro, users do not need to pass different verification “levels,” as new users can start trading immediately with a 2000 EUR cap. And of course, to open up a real money account in eToro and begin trading with this broker, you have to be at least 18 years old. 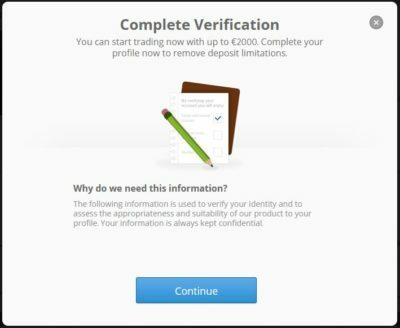 You can easily complete the verification process after you create your trading account with eToro. To complete this process, you need to click on the “Complete Profile” tab placed on the upper left-hand side of your account dashboard. You should note that before eToro can verify your trading account, you will need to provide some personal information like your Government Issued ID, Proof of Address, and go through a phone number verification process. Completely going through the verification process can also eliminate the deposit limitations being forced on new accounts. Also, it is essential to provide accurate information when giving the required details as the system divides the users into different levels. If you are a newbie in trading, the system will give you some warnings about copying trades, and tell you it is impossible due to the high risk involved. Trading on eToro is carried out using its in-built OpenBook and WebTrader platforms. As said earlier, mobile apps are also available. The WebTrader is inherent and easy to use. It comes with different features like automated strategies, ‘One-Click Trading’, and some technical indicators. Trailing Stop Loss is also available for better risk management. eToro’s platform is not different from other platforms and doesn’t offer any innovations you won’t get on other trading platforms; however, it is pretty light and comes with a built-in trade copy feature. The WebTrader platform is completely synchronized with the company’s OpenBook, which makes it the ideal place to monitor, control and analyze your trading portfolio. eToro gives a fixed spread of 3 pips on EUR/USD currency pair and does not charge any commission fees. However, in contrast to most fixed-spread brokers who apply a 2pips, or even tighter spread, eToro’s spreads are a bit too high. Cryptocurrency trading fees and spreads are also quite hefty comparison to other companies. While most of the exchanges charge small 0.2 – 0.25% fees on Bitcoin purchases, eToro would charge you 0.7% which looks unattractive to say the least. For other cryptocurrecny purchases fees may go as high as 5%. This might scare off many potential cryptocurrency traders but if you look on the bright side you realize that the extra functionality realized by one of the best social trading makes high fees justifiable. But we have to note here that eToro is not a crypto exchange like let’s say Binance or Bitstamp, but rather a multi-asset and social trading brokerage which offers traders an opportunity to diversify portfolio over broad range of markets. 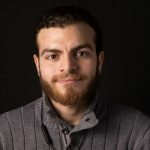 That is why eToro might not be the best destination for those looking for cryptocurrecny exchange services, especially when it comes to trading fees. eToro only allows trading in U.S. Dollars, therefore, any deposit in a different currency is converted to USD upon receipt. Depending on the regional regulations that a trader’s account is subject to, the minimum deposit needed to open a trading account ranges from $50 to $ 1,000. Neteller minimum deposits, for instance, vary from $50 – $1,000 and a maxes out at $10,000; while Webmoney and GiroPay have a $50 – $1,000 minimum and a $50,000 and $30,000 maximum respectively. Yandex has a maximum deposit of $5,000. Users can replenish and withdraw from their accounts through debit/credit cards (Visa, MasterCard), PayPal, Yandexbank, wire transfer, and e-wallets Skrill, Neteller, Giropay, and WebMoney. Processing Withdrawals through debit or credit cards & bank wire transfer may take up to 8 business days. eToro is a pioneer in social trading, with strong regulation and ten years of experience. It is the predominant online broker for investors who appreciate such networking activities. eToro offers traders an excellent opportunity in the financial market with its newly integrated eToro trading and social investment platform, as well as its mobile app. Also, the brokerage offers a Trading Academy, a Blog, a Trading eCourse and live webinars to educate amateur traders.